In June of 1997, 98 Ghanaians were deported from Libya. Prior to their deportation, they were arrested at their various workplaces and detained for periods between two and three months before their deportation. Over 50 more Ghanaians were left languishing in Libyan cells awaiting deportation. In November 2000, hundreds of African immigrants, mainly Nigerians and Ghanaians, living in Libya were arbitrarily rounded up beaten and some killed by Libya security forces. Their possessions were taken away from them and later expelled from the country. Embarrassed over the treatment, the Ghanaian president “at the time” J. J. Rawlings personally traveled to Libya to take delivery of his citizens. In 2004, 251 ghanaians were again deported from Libya. Ghadafi was among the Africans that were forcibly pushed out of their land by the Arabs and some Europeans. Decades now, those false (white) Africans have dehumanized other Africans who suppose to be part of them. So if Ghadafi is really serious to create the united states of Africa, he must be ready to expel the Arabs and whites Europeans that forcibly settled in Mauritania, Morocco, Tunisia, Egypt and other white occupied lands in Africa. Over the years, Ghadafi has been one of the covert hands behind every conflict in the region. He overtly trained Charles Taylor to take on parts of West Africa whilst he relaxed in his multi-million dollars palace in Tripoli. In 1997, the French Weekly Newspaper published some of ghadafi’s colleagues assets. For example: General Sani Abaca of Nigeria, $20 billion, late Ivorian President Flex Houphet. Boigny, $ 6 billion, General Ibrahim Babangida of Nigeria, $ 5 billion, the late President Mobutu of Zaire, $ 4 billion, President Mousa Traore of Mali, $ 2 billion, Henri Bedie of Ivory Coast, $300 million, President Denis N'guesso of Congo, $200 million, President Omar Bongo of Gabon, $ $80 million, President Paul Biya of Cameroon, $70 million, President Haile Mariam of Ethiopia, $30 million, President Hissene Habre of Chad, $3 million, indicted former Liberian President Charles Taylor, The late President Gabassinga Eyadema of Togo, former Ghanaian president Jerry J. Rawlings, Bokena Faso’s Blaist Camporare, and the late President Samuel Doe of Liberia; a host of African government ministers would make an updated list. 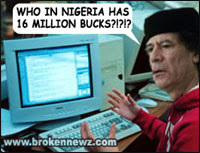 Portion of these stolen monies are covertly kept in Libya. Is Mr. Revolutionary “Ghadafi” prepared to return the portion of these stolen monies to the appropriate countries? Is he ready to confess his evil deeds in the region? For decade now, Qaddafi’s campaign to install tele-guided regimes in various African states had encountered series of frustrations but he still believed that the United States of Africa is a prerequisite to the unity of Africa. In my view, there is “the continent of Africa” but there will never be “a United States of Africa”. The above names and assets serves as my convincing point for my view. Compare the assets of these dictators to the conditions of the masses in the region or the living condition of their citizens. The continent of Africa will always be the diamond mine of the west. Ghadafi must really be mad “to go causing noise all around the continent” for something that he has never encouraged in the region.